In a small bowl, whisk the mustard with the vinegar and gradually add 1/4 cup of olive oil until blended. Mix in thyme, lemon and top with salt and pepper. In large skillet, add 1 tablespoon of olive oil over medium-high heat. 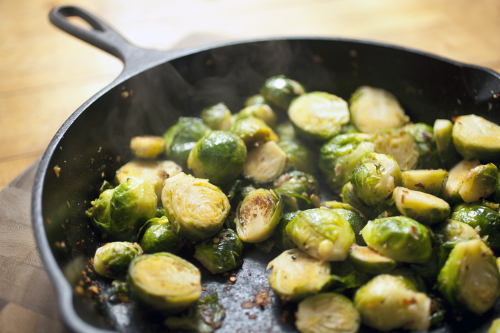 Add brussels sprouts, stirring occasionally, for 6 minutes until crisp-tender and charred in spots. Remove from the heat and stir in dressing before serving. Coat inside of an oven roasting bag with flour and place brisket inside bag. Pour liquid smoke over brisket and add garlic, dry onion soup mix, black pepper, onion, carrots, and celery before sealing the bag. Using a fork, make two sets of holes in the top of the roasting bag. Place bag in a broiling pan and insert into oven. Bake for 6 hours. Place potatoes in a cheesecloth and wring to extract moisture. In medium bowl mix the potatoes, onion, eggs, flour and salt. Add oil to large skillet over medium-high heat until hot. Place large spoonfuls of potato mixture into skillet, pressing down to form ¼” - ½” thick patties. Brown on one side before flipping to brown opposite side. Remove from skillet and drain on paper towels. Serve hot with applesauce, sour cream and chopped green onions.